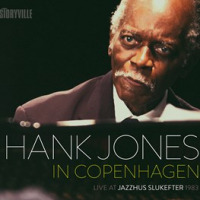 The oldest of the three Jones brothers (Hank, Thad and Elvin), Henry Hank Jones was born in Vicksburg, Mississippi and grew up in Pontiac, Michigan, where he studied piano at an early age and came under the influence of Earl Hines, Fats Waller, Teddy Wilson and Art Tatum. By the age of 13 Jones was performing locally in Michigan and Ohio. While playing with territory bands in Grand Rapids and Lansing he met Lucky Thompson, who invited him to New York City in 1944 to work at the Onyx Club with Hot Lips Page. In New York, Jones regularly listened to leading bop musicians, and was inspired to master the new style. While practicing and studying the music he worked with John Kirby, Howard McGhee, Coleman Hawkins, Andy Kirk, and Billy Eckstine. In autumn 1947 he began touring in Norman Granz's Jazz at the Philharmonic concerts, and from 1948 to 1953 he was accompanist for Ella Fitzgerald, developing a harmonic facility of extraordinary taste and sophistication. During this period he also made several historically important recordings with Charlie Parker for Norman Granz's labels. After several years as a freelance player, which included engagements with Artie Shaw and Benny Goodman, and recordings with such artists as Lester Young, Milt Jackson, Cannonball Adderley, and Wes Montgomery, in 1959 Jones joined the staff of CBS where he stayed until the staff was disbanded 17 years later. With his rare combination of talents as a strong soloist, sensitive accompanist, and adept sight-reader, Jones has always been in great demand for recording sessions of all kinds. By the late 1970s his involvement as pianist and conductor with the Broadway musical Ain't Misbehavin' (based on the music of Fats Waller) had informed a wider audience of his unique qualities as a musician. 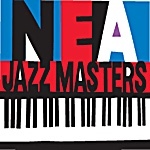 During the late 1970s and the 1980s Jones continued to record prolifically, as an unaccompanied soloist, in duos with other pianists (including John Lewis and Tommy Flanagan), and with various small ensembles, most notably the Great Jazz Trio. 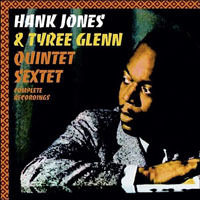 The group took this name in 1976, by which time Jones had already begun working at the Village Vanguard with its original members, Ron Carter and Tony Williams (it was Buster Williams rather than Carter, however, who took part in the trio's first recording session in 1976); by 1980 Jones' sidemen were Eddie Gomez and Al Foster, and in 1982 Jimmy Cobb replaced Foster. The trio has also recorded with other all-star personnel, such as Art Farmer, Benny Golson, and Nancy Wilson. In the early 1980s Jones held a residency as a solo pianist at the Cafe Ziegfeld and made a tour of Japan, where he performed and recorded with George Duvivier and Sonny Stitt. All About Jazz musician pages are maintained by musicians, publicists and trusted members like you. Interested? 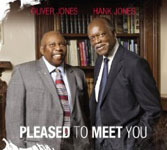 Tell us why you would like to improve the Hank Jones musician page.